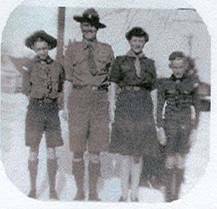 In the fall of 1989, Warner Clarke (66-70) and Rod Ioi (65-70) visited the late Mrs. Muriel Moore (47-70), wife of the first camp ranger J.C. Moore (47-70), and tape recorded her memories of JC, the early days at HSR and much of its history. The resulting articles were published as a six part series in the Alumni Thunderbird starting in February 1990. They are reprinted here as one article. Jim was in school. He was in Scouting all his life, of course. That would be a whole other story, what Scouting was like in those days. You wouldn’t recognize it as Scouting these days. I found a lot of those pictures in here. Anyway, the Scouts got permission to use Bigwin Inn on Lake of Bays. Well, it was the biggest, most expensive summer resort we had in Canada. Wealthy people came up from the States. And they asked the Scouts to supply all the caddies out there. We started a camp, and from June to the 1st of September, they ran a regular Scout camp on the Bigwin Inn grounds at Lake of Bays. The boys weren’t paid, they depended entirely on tips. But the wealthy people they served tipped them very, very well and Bigwin Inn supplied the food. So that was the first camp that I guess Toronto had or had anything to do with and it was run by this group of young people that Jim’s best friend was in charge of. Jim was working at the Exhibition in the summers, and they suggested using Scouts as ushers on the Grandstand and the Horse Show and the Coliseum, all the events that went on there. This was in the early 1920’s. So they set up a Scout camp inside the Dufferin Gates where it used to be a football field and baseball diamond. Boys came from all over Ontario and stayed there for the three weeks. There were only two weeks for the Exhibition but they set up and got things organized. Jim organized that one. We had a very, very good Scout band in those days, and they used to march them off through the Exhibition. They had inspection first and everybody had to be shined, and they really were a smart group. They marched them through the Exhibition and all down through, stopped in front of the grandstand; that contingent dropped off, and the rest went on down to the Coliseum. They handed the ribbons out at the Coliseum, followed the judges around and took notes on who won on all the classes. They did that all day. The others had the two grandstand performances to usher. Another group had ushered for the horse show at the night and the afternoon horse show that was on. So Jim was involved in that, and when he finished school, the Exhibition asked him if he would come and work there on a permanent basis. So he went in the agriculture with the men he worked with, Sam Foss and the ones he worked with on this judging. So in the next 10 years, he worked there, then in ’39 came the War. So, now back to Scouting, and I can not think of his name, I can see his face, and I know where he lives in Bronte, but he was Commissioner for Rovers at the time. And he was head of the Wool Board. He was a wool importer, I guess. And so the Exhibition had to be closed because the Army moved in and took over the buildings and the staff were given the choice of either staying on and sort of putting in time – everyone said, “Oh six months and the war will be over” – or else going on loan to some government agency and work there. Jim chose to work, and this man contacted him asked him if he would consider working for the Wool Board. So he took over and for the four years of the War he was all over Canada; storing wool, meeting trains, boats and what not, distributing wool to where it was needed. Canada was sort of the centre for everything made of wool. So then came the end of the War, but the Army still wanted the Exhibition because they were going to discharge everybody from there so they said they needed it for at least another year. The same chap came back and said well you’ve got a year before you can go back to work. Would you consider going out and looking for a camp? Jim thought that would be good, he didn’t want to go and sit around, he hated that. So he then started looking. They wanted a camp in the west end, one in the east end, and one wilderness camp up north. About that time, they sold Crooked Creek, and they had a hundred acres up on the top that nobody ever used, it was part of a farm. They got a nice healthy sum for that, where they built the hospital. The Conservation area took over the lower valley and gave them some little bit, I don’t think it was much they gave. But [Executive Commissioner] Burt Greenaway who was head of Scouting at that time, had a dream of owning a building of their own and starting a real wilderness camp. Now, they have no camps in Toronto, Crooked Creek is gone, but at the same time, Metropolitan Toronto [Scouting Region] starts to form, and all the Municipalities come into Toronto and they don’t want the responsibility of their own little camps, having to support them, and having Toronto using it. So most of them offered them to the City, and that’s how we acquired Goodyear Memorial Scout Camp up in Hockley Valley. Toronto Region had bought that from the Lakeshore Group. In Cookstown – Oba-sa-teeka, was from another district out this end, and they were sort of taken in. So that sort of looked after the small camps in the west end. Then, we started looking farther a field. We were at Gull Lake at Miner’s Bay on holidays where we spent sometime every of our holidays year with the same group of people. It was a gorgeous day like today in September, hot and beautiful. Jim decided he would go in to Minden and see the Real Estate people and see what they had to offer. So he came back and said yes, they had some property, would I like to go see it so I said “sure”. So we took off. It was a fairly large 2 or 3 hundred acres at the end of Deep Bay. But it was flat farmland. It was on the water on Gull Lake but it didn’t have any wilderness aspect to it at all. It was just flat farmland, Quite a few buildings. And we decided or he decided he didn’t think much of that. So we went back and said no, that wasn’t satisfactory and he said have you anything else? No, they didn’t have anything else, the only thing they might have was a lumber tract, but that wouldn’t do for a camp. That was much to big and too wild and would never be. So he said is there any way I can see it, I’m up this way and I wouldn’t mind going up and having a look. So he went out and he could only get as far as the mill yard. From the mill yard down belonged to The Hon. 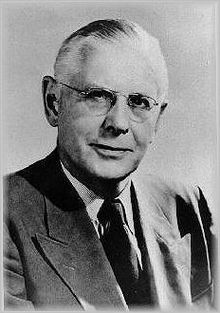 Leslie M. Frost who became Premier of Ontario, and Ernie Fee of Lindsay, Fee Motors. They had bought several hundred feet all along that shoreline of Kennabi and put in a private road and had the gate locked, and no body could go down. So as far as we could go was the mill. Well, you don’t see too much coming in the road, and oh what a road it was. There were three places they had bull dozed out where the lumber trucks passed. They had them timed so one went in to the little area and the others coming in this way passed then they went on and they had it all figured out and timed because no two could ever meet on the road. There was a cook there and Jim said well isn’t there anyone around anywhere? Well the men are all out, they won’t be back until dinner time tonight, they’re all out working. Being very brave he said well can I not go out and talk to somebody? Well the boss is out with them, Nells Webster is out working with them, and you go here and you follow this trail and you go there, and so Jim started out. It wasn’t very long before he didn’t know where he was or where he was going. He was in the middle of nowhere. I doubt whether he had a compass or not but he’s usually fairly good in the bush. Anyway he kept on the direction where he was going through the bush and suddenly he heard a chain saw and he thought oh my gosh, I’m saved. So he started following the noise of the chain saws. And he’s down in the valley and all of a sudden, no chain saws. Dead silence. Everything stopped, not a sound. So there he was, he didn’t know which way to go, where to go, lost all contact with any humans. Eventually, he decided, well, he might as well just follow his nose and go in the direction he had been hearing the noise. He crossed a couple more ridges, and there were all the men seated. It was lunch time and they’d all sat down to have lunch and everything was quiet. So he talked to Nells Webster, he was Manager acting for Bill Harris who was a lawyer in Oshawa. And he had bought it when he was representing someone and the man lost it, and he picked it up. Mill Valley was always run as a temporary, get in, take the choice, the best, and then move on to someplace else. They’d do reasonably large wood lots for farmers, go in and cut up all the timber, pay them for what they took and move on. Everything was very portable. They had two more years on their contract with this land to cut, it was a very large tract, but they said after that they were through with it and they were leaving, getting out. So there wasn’t too much to see around except the general outlay of the land. You couldn’t see any lakes or anything of that type because it was just bush. But Jim was very impressed with the wildness of it and they told him there was a lake over here, and another one here, and the big lake was down here, which was Kennabi, but no way of getting to it. Kennaway road was impassable and it was private property all down there. So he came back to the cottage and thought about it and decided it was pretty nice. So the next day he decided to go and take another look. This time I think he got down to Holland and Minnie and down in there and saw those lakes. And it began to look better all the time. So he went back into Minden and he put a down payment on it [$25.00]. So for a very short, maybe three weeks, we owned all of Haliburton Camp. Then he came back and got the Camp Committee together and they all arranged to go up. Well it took them maybe two, three weeks before they could get everybody together. They went up at dawn on Saturday morning. By this time, it was colder than cold, a miserable day. So there again, they got as far as the Mill. The Mill people were expecting them. They served them lunch, which was a bit of a surprise to most of them, because no one’s allowed to talk in a lumber camp at meal times. You come in, you eat and you get up and get out and give the cooks time to get on with the meal. Nobody says boo. And they couldn’t figure out why all this quiet. Everything was dead quiet, except, can I have that or pass me this, just sort of a mumble. So they thought maybe it was them, that they weren’t very popular. But when they got outside, things changed. Everybody was talking. They all went outside then, sat around and smoked till it was time to go back to work. So the men started out in all directions to try and see what they could see but they sort of went off through the bush, trying to get a look at Kennabi, which they said was the biggest lake. And a couple of them got sort of lost, and they took a while to find them and get them out. I don’t think many of them got down as far as the lake. But anyway, they were all impressed with the property, and went back and talked to everybody else and it was decided then to buy it. So that was the fall of 1946. So ’47 then, was the first year, and they asked us to go up and spend the summer there, get to know the land, and get to know all the people in Haliburton. Sort of act as public relations and see what kind of a good impression get. Because we’re tax free, Scouts are, and owning all that land was going to not sit too well on some, because they didn’t have much income in those days, the merchants and the people of Haliburton. It was a small village of under 2,000 in those days. So the idea was to make friends and try and ease in, sort of and then get to know the land and all the surroundings. So we had a wonderful summer that year. We went up and had my canoe, it’s still up at Pete’s lake, up at Kurt Wipper’s Museum [now The Canadian Canoe Museum]. And that-was all we had for transportation. Now, we couldn’t buy the land, the land wasn’t accessible without the shoreline of Kennabi, along the storage building and all of that bay. And they (Mr. Frost) didn’t want Scouts there, or they didn’t want to, be there in a Scout camp. This was a hunting camp they had. So they agreed to sell to us. So we bought from the mill, the 4000 acres, or a little bit more, and then we bought what they had, and the private road that went down. So they had a shack there that they used every November, and that was the dining room and the kitchen of the lodge. There was nothing in it really. There was an old, old wood stove in the kitchen, and there was a long table, well I guess the table, it’s still there. It was a home made table, and the long bench on each side, and a bunk. That was the extent of what was in the cabin. Of course I wanted to know what’s there. Well nobody knew because nobody had seen it. Nobody had got down to the lakes. So we went up without a clue as to what we were getting into. And the roads were atrocious, of course. So the Mill was still working, they had another two years. And they decided they better clear out all around Kennabi, all around the shore. They had several piles of logs and they were working there. And they would bring them in where our docks are now, where the staff docks were. They had one great big flat bottomed boat with a big workhorse 8 motor on it that towed the logs down the lake. It took them two days to get from the top of the islands out there down to the bay where we were. And then they have these cranes that loaded them, and the trucks backed out in the water there and they loaded them. They had started to use the private road, other than that, they would have to wait and take them out in the winter across the lake by snow, and come out somewhere else, I think. Of course, everybody was fascinated watching them take these logs out. We spent a lot of time standing around watching the thing. They had the awfullest old army vehicle that hauled the logs from the water up onto the truck. 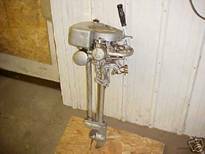 Was the worst contraption you ever saw. And Jim made a deal with Ken Webster, that if he could keep this old machine going, would Ken take his bulldozer and clear some spots for us? He was working for the Mill, he was the son of the manager of the Mill. So as long as Jim could keep this old army thing going, Ken would bulldoze. That’s how we got around the storage building and all that cleared, and the second road in there. He did a lot. He worked as long as they could keep this old artillery tractor going. Then after that we paid him for different jobs. He was awfully good, he would try anything. So then, we would spend the rest of the time hiking around to see what the other lakes looked like, finding then and sort of generally mapping them out, then going farther a field and seeing Kennesis and all the surrounding lakes on up farther. I think it was that first year they allowed two groups on a temporary basis, to come in. One was Tucker’s. His father was something to do with Consumers Gas, I think. I don’t know why they picked on him, but they allowed him to bring a small group of boys in as an experiment. I may be mistaken but I think the other one was Jack King’s, the Saint Olive’s [actually the 101st Toronto from Windermere United Church] group in here. But there were two groups allowed to come in that first year and just sort of try it out. Of course they had no boats or anything else at that point. And then the Mill decided that they wouldn’t bother with some of the timber that they didn’t want, they’d just pack it up and get out. There wasn’t enough to make it worth while. So they left us their boat and motor and so for the first time, we had transportation. Everybody in Toronto was so excited and they made so much fuss over finding this camp and how wild it was and what a marvellous place it was going to be and so forth. Everybody wanted to see it. So one group, I think it was an east end group, hired a Grey Coach bus, filled it with all the leaders, and they decided they would come up and see their camp. Well, it was in May, I think it was in 1947, I think it was still that first year, well of course the bus got about as far as Curry’s Mill there, and looked at the road and said no way! So somebody walked in to say that there were 47 some people back there. So Jim went up to them to the Mill Valley and said was there anybody that could go and get them. Well somebody said oh yes, we could do that, and they sent one of their lumber trucks out. So a large percentage of them were women on this bus, some of them in their cub uniforms and others not. You know it’s a flat bed truck, but unfortunately they forgot to take off the chains. So all these logging chains were all over the floor of the truck, and these people were sitting on them, not very comfortably, particularly the women. And they went over that road and you know how bumpy it would be. They were pretty shook up by the time they got them in and brought them down. The mosquitoes of course were out like crazy, and what did we have, we had one room. We didn’t have anything; we didn’t have any place to sit or anyplace to do anything. We couldn’t even say come in and eat inside. We couldn’t put 40 people in. I think we tried to make tea for them because some of them were dying of thirst. Nobody would drink the water in the lake, oh they thought that was going to kill them. So we tried to do what we could. Didn’t show them much, couldn’t even take them down the lake, we had no way of getting them down. They could stand on the shore and look down the bay, and that was about it. At first, there were a lot of individual groups that came up. They just drove up, maybe four to a car. Everybody wanted to see the property. It wasn’t until the next year that they started to get ready to let campers come in. We acquired those first two army trucks and Kenny Woods (48) drove one up. I don’t know how the other one got up. They had been battery carriers. They had never been off the airfield so they weren’t run very much. They just went out, took new batteries out to the planes and drove back; that was it. So Kenny drove the truck and that was our camp transportation. We still only had this flat bottomed boat and my canoe. I guess we had to take the campers down the lake in small numbers in the boat. I don’t remember taking them up and down the lake in those first years, but that’s the only way we could get them up. The boat was a big flat work boat; it was probably 18 feet long and very wide, very sturdy. I suppose it would hold twelve or so. We started to open up Twister Point and the area in front of the Hub, and gradually worked around the lake. Individual leaders started arriving, and we put those on the islands. They set up camp there. Then the Rovers sort of took over where Mill Valley cabin is now, up on top, and they called themselves the Redmen on the hill. And they kept a permanent camp going there. They’d set it up, then some would go home and somebody else would arrive. They just sort of kept it going that way all the time. So that is about the way we got through the first year of real camping. I don’t know when Big Bear was opened up, but was probably one of the earlier ones. I don’t think we ever took cars down there. We probably used the army truck. The spots where we had access were used at first. From there on, it just grew, like topsy. The Pine Island [where the Survival Program is now run] and the two islands with the pines on them were used. I don’t think we ever used Buck for years, but Doe, I think was used, and the Pine Island. And there was a Heron rookery on there when we first arrived. It didn’t last though. I guess there were too many people. But there used to be a guide that lived in Wilberforce, and he used to bring a group of fishermen over the mud portage and down through by the Trapper’s Cabin. 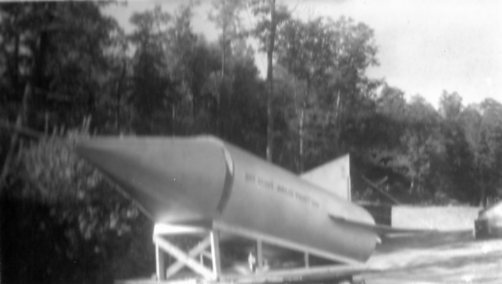 He had a boat stashed somewhere up in the bush behind the Trapper’s Cabin, and they would fish Kennabi Lake. Apparently he told them that it was the middle of the wilderness, they’d never see a soul, and the fishing was absolutely super. He didn’t know of course that it had been sold. So I was down on one of the islands, swimming. We didn’t have any docks at that time and there were some good high rocks down there. I think I’d gone down for a swim and a bit of sun. You know the walk they would have, hauling boats? They had been tramping for hours and hours to get through, and here they get through and there’s people in boats. I think that was the last party he ever guided into there. But they couldn’t figure out how anyone else had ever got into this lake out in the middle of nowhere. We started taking on more staff, I don’t know who was the next one but Walt Barnes (48) was a marvellous mixer. He’d spend all of his time down with the campers. And he was a great story teller and was good at camp fires. He’d go down and have supper with them and talk. In those days, the staff fed themselves. There was no kitchen because there was nothing there that first year. So they had to sort of fend for themselves, the two of them. I guess Ken probably ate in town. He was in town most of the time. It took hours to get in. In that old army truck, it was quite a trip. The Atkinson Foundation, built the first section of the Hub; the kitchen part [in 1949]. They built that for the Composite Camp. Composite Camp was to look after these single boys that couldn’t get to camp any other way. Years later in late November , they put on the dining hall. The lake was pretty well frozen by the time Jim and I left that year. It was snowing. 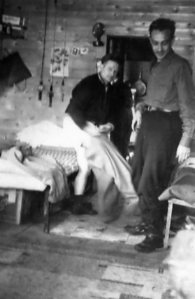 That was the closest to winter that we had spent in the camp because the men were working and we had to stay. They worked as long as weather permitted to try and get that building closed in. When Composite Camp started, the boys had tents all down below by the lake. They came up to the kitchen to eat and ate in the kitchen part. I don’t think there was that big stove. There was a much smaller stove in those days. There wasn’t any refrigeration. We didn’t have power for it then. Back in ’48 or ’49 when the camp started, when Mill Valley Lumber Company left, one of the first things that was done was to bring the buildings down (from the Mill site). A lot of their buildings were portable, and a lot they took with them. But what they couldn’t take, they left for us. There was a couple of fairly nice homes that they hauled out on skids. One was where Bill Wilson is living now, just where the road joins the highway. That belonged to the Sheardons of Windsor. They’d come up on holidays. I don’t know how they got in there but they fell in love with the area and went to work for Mill Valley. He was with Chrysler in Windsor, gave up his job and came up and worked there. Eventually, his brother followed and came up too and lived there. So they were there and they had a house which they took out. 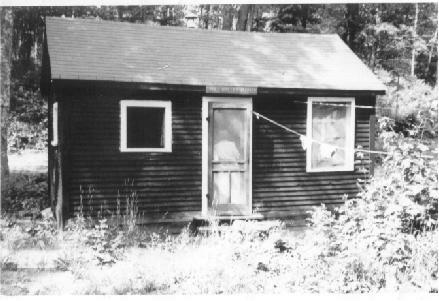 The first staff cabin – that was the office from the Mill. It was in the swamp, originally. Then they brought in a little cabin. We used to call it the henhouse. It was like a lean to and we fastened it on the back of the Staff Cabin when the staff grew to six. This cabin was the office at the Mill Where Neils Webster lived. He had one room as an office and the other room was a bedroom. It was divided in half. It was brought down from the Mill and put where the picnic area is. That was all swamp in those days, or at least very wet before it was filled in. We later moved it. It’s the old Mill Valley cabin up on the hill. Then they built Lakeview and Driftwood. Then of course all the five cabins were built down at the other end. That was around Composite time. They were built for staff. I was asking my son, Alan what his early memories were. He said he remembers sleeping in a tent, right out behind the kitchen of Kennabi Lodge. Just out the back door, they had a tent there with a floor. That’s where he and Don lived until they built the cabin where we eventually lived. That was when we were putting the living room on the main building. He says it was a building that was up at the Mill that they pulled apart and brought down and built their place out of. I think it was a stable that was up towards Holland and Mislaid that was in a marshy area. There was just a very short time it could be brought out, when the roads were in condition to haul it out. He thinks it was something from the Mill, so I don’t know who’s right. The Group Committee decided we needed a hospital. Plans were drawn up. Gordon Wallace was an architect, and probably his company drew them up. He was a land expert. He could look at a piece of land and say how firm it was and what it would hold. He traveled all over the country, China and Japan, putting in foundations for earthquake and quicksand, and that type of terrain where they had trouble with getting buildings of any size. Whether he would be an engineering company or an architect, I’m not sure, but he was a great person. He was on the Group Committee, and he designed the building. It was supposed to have eight rooms, and then a sitting room where the fireplace was put, and that was it. As it started to come along, something came up, ventilation or something that they wanted at each end. Jim thought it should have some kind of cross-ventilation. So he decided on a Sunday to go down to Fenlon Falls where Gordon Wallace’s cottage was, and discuss it with him before the workmen went ahead with it. “Well I suppose the same as any other camp”, he said. But can sick people wander outside? We didn’t have a nurse at that time. Eventually I supposed that they counted on having some one that would look after them. Well, they weren’t just too sure about that. So I said what about meals. I said there’s no way we could bring meals from our place up there. They would be stone cold by the time it got up. You’d be running up and down the hill. Furthermore, you can’t leave a sick person up there by themselves without somebody staying with them. So they began to sort of look over, the situation again. At this point, we had the bare walls and that was all. So they realized they’d made kind of a mistake. A few other things were not working out the way they had expected. So they scrapped the whole plan and made that into what it is, Pow Wow, meeting place for get-togethers and camp fires on rainy days, and built the little hospital down by us, which was handy to the kitchen. 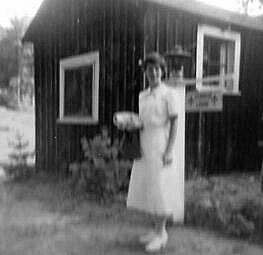 By the time that was up and finished, they hired Helen (Cruden) Anderson as the first nurse. They put a bathroom in there, and just the first section, just the four beds first. Then they put the operating room in, and the other four beds at the other end of it. The only buildings we had when we bought the property was just that one kitchen and dining room, and what they left at the Mill. The Trapper’s Cabin was there when we came. Everything else was built by the Rovers. These Rovers on the hill that camped there, were great. They worked continually up there. There was another group of leaders that used to spend a lot of time there. Steve Coates, and it seems to me, Helen Anderson’s [nee Cruden] brother was in that crowd. They used to come up and sort of set up the floats and things for the annual Rotary parade there. He was a designer for Simpsons, a window designer, so he knew how ‘to put things together. That was all built up in Pow Wow, all that kind of stuff was put together in there. You know those topographical maps, we used to have so many of them. I don’t know where they disappeared to. A lot of the stuff I left in that living room, the old traps and the old skates that you screwed on under your shoes that we found. We used to go up and poke around the old farms up there and get a lot of that stuff, the broad axes and the yokes and all that stuff we left up there. Throughout the property, especially by Pike’s Peak and the gorge you see the remains of the lumber chutes. These were from 1860. They came from Ottawa, those logs. That’s where those capstans and all of those things were used. Somewhere up in there they say there is a camboose camp that was used at that time. They tried to bring the logs overland and down through that system, and sell them in the market here. That was a way back in the 1860’s, about the time they were starting to colonize, when the old Kennaway Road was a stage coach road, the one that went behind the mill and down. Colonization was started in England. They went over there, got people who were dissatisfied, sold them so much land and told them it would be beautiful. We did have the route of where they came across Lake Simcoe or Lake Couchiching by boat, then picked up another stage. Then they just dropped them. There were three farms on that old Kennaway, back behind the mill: Spears was one of the names. Where the old lilac bushes were, that was a farm. We got the names of all the people that lived there. They tried to farm, and they had to clear someplace to live first, so they cut down the trees and they built their log cabins. Then they wanted to plant so they cut down some more trees. They had nothing to do with the trees so they piled them in piles and burned them to get rid of them. Got the stumps out, tried to grow, and found that the rocks were down this far, and there was no topsoil. The ‘only thing valuable on the land were the trees and they were already gone. Even in our time, there were farms down on the main road that looked as if they could be used. They were cleared. The Johnson were one, they were next to Paradise Lodge. Their total cash income for a year, was $35.00. That was when they first went up there and that was from cutting railway ties. They grew enough wheat to feed the horses to plough the land to plant the potatoes to feed them in the winter, and that was about the cycle. And I think Stan Parish’s brother had a sawmill down on his part. I guess the year we built the Staff Cabin [later known as Flavelle cabin] was the year, because we cut our own pine, took them into him and the boys went in and helped the sawing. We got enough lumber to build the Staff Cabin. At that time, Composite was going to operate down there, entirely separate from us up here at our end. We looked after all the campers on the lake, and they looked after all the Composite Troops. Then somebody said that’s no way for Scouts to live, they should be out cooking their own meals. They shouldn’t be coming into a dining room and eating. So they changed the whole thing around and they made them cook as if they would if they were with their own Troop. That’s when staff started eating in the dining room. At that time, we were running two dining rooms, one up at our end and one down at the other end. They had the friendly competitiveness between Kennaway and Kennabi when they used to steal some crazy thing. There was something we used to anchor in the water that they kept trying to steal. They used to leave the light on it all night and they’d leave people sitting up all night to guard it. There was a great big aluminium thing we made for the parade one year when we first had the astronauts starting to build rockets. We had a big rocket made. That was out there for a long time, but there was something they used to try and steal back and forth, something stupid. That was started by the Rovers. They used to come up every spring, and we had someone at Northern Electric that used to get the wire for us. They used to come up every spring and they had these big round spools with the wire on it, and they put them on the back of a truck, put something through the middle, and they’d string off the wire and fasten them to the trees. In the first year, they had staple things to fasten it to the trees. They discovered that when the trees bent in the winter, the line broke. So the next year, they put a loop around the tree and then slung the wire through and give it some leeway. Then somebody higher up got interested and they supplied the underwater cable. That was put down to the camps. Then in ’67, Murray Crimless (68-73,81-95) built the switchboard as a Centennial project. He was working at Northern Electric too. We didn’t buy any of those phones. The old ones that you’re’ familiar with came from towns where the Bell was putting in their own system, and they had no use for the battery operated ones, and they gave them to us. So there must have been somebody high up in Bell or Northern Electric that got these bigger things for us. We used to have these stupid rings, when one phone rang, they all rang. There were different codes. It was one for our cabin, two for the Hub and three for the hospital. They were only supposed to be used in an emergency. We used to always turn over one campsite to the Cobourg Training School. They would switch on a Wednesday and they’d bring their, “good” behaviours up. They’d stay for a week, and every Wednesday night, after they got settled into camp, because the camp was sort of permanent, there wasn’t much setting up, you’d hear them all coming down the lake. The first thing they learned was how to scale a wall, which was that one on the far side just outside of our cabin, the rocks that they cleaned off. They’d bring them all there and teach them how to scale. I thought, what a thing to teach at the Training School the first day out. One year we brought some boys up to work. They had been in training school and were going to graduate. We had six of them on Staff. That was quite an experience. Mostly they’d been in for stealing a car, or something of that type. Nothing terribly serious, mostly from broken homes. We thoroughly enjoyed them. They were great. We let them go one weekend but they weren’t supposed to leave camp. We got pretty scared Monday morning. One came in very late Sunday night and we thought the other one wasn’t going to make it. I forget how many miles he walked to get in. But he made it back, as he promised. They were sent up with their big boots and the sort of a khaki coloured pants; better clothes than any of the rest of the Staff, had in pre-camp when they were painting boats and all that, and nice shirts and flannelette pyjamas. But the day they finished there and were going back to their school or wherever they had come from, all of a sudden we saw smoke and we went over and they were burning every single thing, all these good clothes. Apparently they just absolutely hated them, I suppose because they had to wear them day in and day out. By that time I think they were allowed to bring some clothes of their own. And they were allowed to have their watches; that was the biggest treat. They took all that stuff away from them. You’d think that someone had given them a million dollars. I think the “wool merchant” in Bronte was Mr. Tisdale.